The nice thing about making your own gravlax is that it costs just 1/4th of the price compared to your nearest snazzy delicatessen. So you can be generous with it. And you can intentionally make more than you need, so the cook has a “treat” when the meals are done. 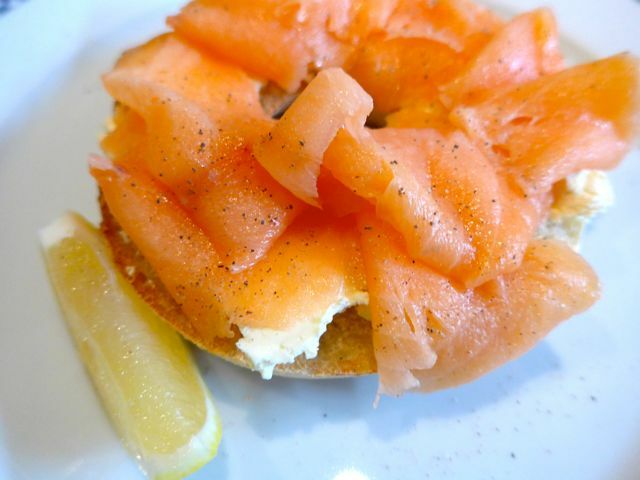 I am an early riser by nature, so when I get up after a big dinner the previous night and go rooting around the fridge for something to eat, a toasted bagel, generous amounts of cream cheese and heaps of gravlax are one of my favorite treats. Leftover deluxe. Alternatively, try the salmon in some scrambled eggs or an omelette. Yum. Absolutely. It costs so much less and you are right. One can be generous in portions. You can also customize it to your taste. One salmon from Costco costs less than $30. I usually use 2/3 of the salmon for gravlax and the rest goes to salmon sashimi. I learned from you to freeze leftovers. I thought gravlax will not be good once frozen so we try to eat it all. Where do you buy good bagel in Manila? corrine, I get ours at the Salcedo market on Saturdays, but there is also a bagel place in Bonifacio but I can’t recall the name, in the Megaworld development, on the main road towards C5. Salmon and scrambled eggs. Yum! Im an avid reader of your blog since 2009, but this is my first time to comment. Here’s wishing you and your family a Blessed New Year 2015. Cheers! mm, the only time we have our favorite bagels is when we are in the US or somebody brings them home as pasalubong. the locally made bagels taste like ordinary bread when what i look for with bagels is the chewiness. i never even tried LES bagels in taguig out of fear of disappointment. this christmas season, snr taguig began selling US bagels (not sure if it meant US made or made with US imported ingredients) in 4 flavors (plain, wheat, cinnamon raisin and blueberry) at a reasonable price 180/6pcs. they taste exactly like the one we get in the US (either costco or sara lee). hope it wasnt a seasonal product and they continue selling it throughout the year. You should try making your own. It’s pretty easy. And taste better than store bought! I’m sorry MM, I meant make your own bagels.